Dr Michael Wu has been performing Balloon Angioplasty and Stents in Melbourne for over 15 years. 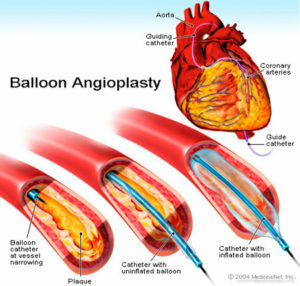 Balloon angioplasty of the coronary artery, also called percutaneous transluminal coronary angioplasty (PTCA), was introduced in the late 1970’s. It is a non-surgical procedure that relieves the narrowing and obstruction of the coronary arteries, which allows for more blood and oxygen to be delivered to the heart muscle. During balloon angioplasty, a small balloon catheter is inserted into an artery in the groin or wrist and is then advanced to the narrowing of the coronary artery. After insertion, the balloon is inflated to enlarge the narrowing in the artery. When successful, PTCA can improve the prognosis of individuals with unstable angina, improve the chest pains resulting from angina and minimise or even stop a heart attack without having the patient undergo open-heart coronary artery bypass graft (CABG) surgery. Additionally, to a simple balloon angioplasty, the availability of stents have expanded the spectrum of people suitable for PTCA. A coronary stent is a tiny, expandable mesh tube made of medical-grade stainless steel or cobalt alloy metal. Stents have been now used to treat coronary artery disease (CAD) for more than a decade. Stenting is a non-invasive procedure with minimal risks, during which a stent and balloon are used together to push back plaque deposits inside of a coronary artery in order to decrease the level of the coronary disease. It is a very common practice to insert a stent in order to hold a coronary artery open and to maintain blood flow after an angioplasty. Like in conventional angioplasty procedure the stent is mounted onto a tiny balloon, which is, then, opened inside of a coronary artery to push back fat and waste deposits (plaque) and to restore blood flow. After the plaque is compressed against the arterial wall, the stent is expanded into its final position, acting as miniature “scaffolding” for the artery. The balloon is then deflated and removed, and the stent is left in the patient’s coronary artery to help keep the blood vessel open and protect them from the narrowing. Some patients might require more than one stent in the coronary artery, depending on how severe and how long is the blockage. Between Balloon Angioplasty and Stent, which one is better? Stent procedures have an advantage over angioplasty alone, because they can provide a permanent structural support to help prevent the coronary artery from re-narrowing of the arteries, even though it may still occur. What is the difference between a Balloon Angioplasty and a Stent treatment? How long can you live with a stent? Angioplasty is a procedure to open narrowed or blocked blood vessels that supply blood to the heart. These blood vessels are called the coronary arteries. A coronary artery stent is a small, metal mesh tube that expands inside a coronary artery. A stent is often placed during or immediately after angioplasty. More than a year after therapy, it may be a bit higher than with bare metal stents. Even though drug eluting stents have a higher re-obstruction rate, most studies go only four to five years after stenting and indicate that the risk of re-obstruction is generally about 1 to 2 percent for either type of stent.